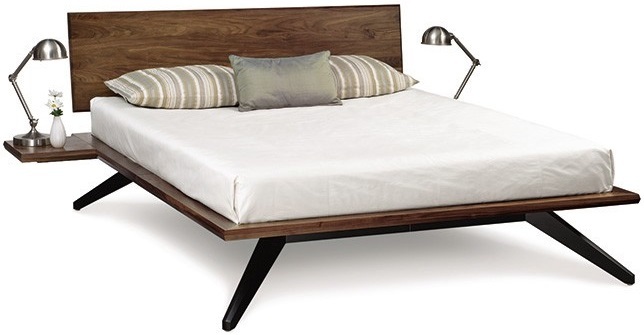 Have you been searching for an eye-catching, Mid-Century Modern platform bed? We have just the model for you – Meet Astrid. Deeply splayed legs produce dramatic cantilevers that are an engineering feat that defy expectations and inspire a sense of possibility. Built to last, the Astrid Platform Bed is constructed from solid cherry, maple, or walnut. The height adjustable headboard provides flexibility for every bedroom. Enjoy this showstopper a little sooner by choosing one of the Quick Ship finishes: Natural Cherry or Natural Walnut* (excludes Cal King size). Complete the look with a pair of attached shelf nightstands and coordinating Astrid dressers. Quick Ship finishes ship in 3-4 weeks. Standard finishes ship in 10-12 weeks.